I say it every night to my son, “May God bless you and keep you.” Sometimes it is just as a reflex, a good habit to fall into so that my boy will have those words of God deeply etched into his soul. Sometimes I can barely hold back the emotion as I feel all of it for him – May God keep you safe. May you know Jesus and what the heart of life really is. I pull the duvet up to him, tuck him in, stroke his head. I want him to be covered over in love and safety. But I can’t protect him. I can’t watch over him. I am unbearably dependent on God to look after my son and hold him through the whiplashes of life. All of this I feel when I pray. It is simultaneously an act of pulling him towards my heart and a holding him out into the hands of God. Among the many ways I parent for him, this seems among the least significant. Feeding him helps him to grow – you can see it, measure it on charts and scales. Talking to him enhances his vocabulary – we hear it expand daily. We can record it, write it down. But prayer? He will not remember these prayers, there are no photos. There are just repeated words that daily float in the air. And then I remember the book of Ruth and the prayers therein, those little evidences of a spiritual world that creep through into the everyday. We had left Ruth waiting to see whether Boaz would marry her or whether the one who had ‘first refusal’ to be her kinsman-redeemer would do it instead. The scene is in daytime, the whole village milling around to witness the business agreement. The closer relative is keen to get Elimelech’s land – but then he refuses when he realises that Ruth is part of the deal. It’s not so attractive a business proposition if he has to take on the dead man’s widow. We exhale in relief, and Boaz marries Ruth. He doesn’t need the money, he doesn’t need the land, but he wants to obey God, honour his family, and protect and love this woman who has shown such kindness to Naomi. God answered Naomi’s prayer: He showed Ruth kindness; she found rest in Boaz’s home. It sounds like hyperbole from Ruth, but she called on the name of the Lord to be her witness. She took Him seriously, and she did not part from Naomi. “The Lord be with you!” Boaz calls to his workers, and “The Lord bless you!”(2:4) they reply as part of their daily greeting – and He was, and He did. Boaz finds himself to be the answer to that prayer, covering Ruth with his protective garment of marriage, giving her refuge in his house and family. Naomi prays over Boaz, and he is blessed with a loving wife and baby boy, even in his old age. “The Lord bless you, my daughter”(3:10) prays Boaz in gratitude over Ruth, even as she asks him to marry her. At the wedding, the whole town is involved and prayers erupt into a cacophony of blessing, falling like confetti over the newly-married couple. And God answered those prayers. Ruth and Boaz did become famous in Bethlehem: they were the great-grandparents of the great King David and ancestors of the greater King to come. 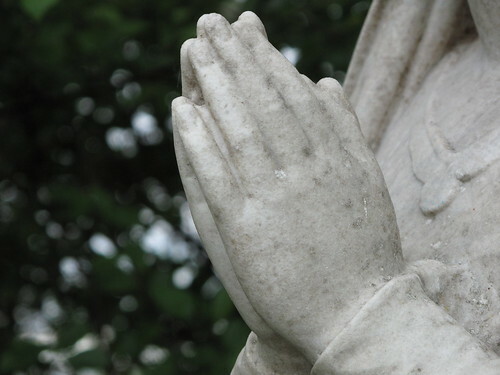 We don’t notice the prayers as we read the story, but when we search for them, they are everywhere, stitched into the rhythm of their everyday life and language. The book is called Ruth, but it starts and ends with Naomi. Naomi is the secret heroine, the undeserving sinner who is confused and bitter, who schemes and manipulates – and whom God blesses anyway. Naomi ends her days pleasantly; no longer called Mara, the bitter one. It starts with the loss of sons, and ends with the women shouting, ‘Naomi has a son!’ It starts with a famine and ends with an abundance of grain. It starts with bitterness, and ends with blessing. And throughout it all there are the prayers, these simple requests from people who trusted in a generous God. And as I stroke my boy’s fair hair, still damp from his bath, I recall again the abundance of the grace of God, His undeserved love, the holy hands that pour blessing into my lap when I least expect it. I remember, I remember that God answers prayers. I want to offer up words of supplication, however puny; I want to have a life stitched together by prayer. May you be like your godly forebears. May you be part of something bigger than your life. May you be like Ruth, the courageous one, who loves abundantly and clings to God. May you be like Boaz, a person of integrity, obeying God’s law even in the secret places. May you be like Naomi, loved despite your failings and hurts; overwhelmed by God’s unexpected blessing. May you know God the provider, who feeds his people. May you know Jesus, who loved you and redeemed you and took you to be his wife, even when you were a poor foreigner, helpless and dependent. May you know the whisper of the Spirit as He directs your life in ways that you are barely aware of. May you know God the trinity, who reverses all our expectations, who raises up the poor and vulnerable, whose ways are not our ways, and who gives us grace upon grace. May the fingerprints of God be all over your life, may his authorship be evident in your story. Amen and amen. In what ways is your life stitched together by prayer? Have you ever seen the answer to many generations of prayer for the same thing? Over these past few weeks I have been doing a series on the book of Ruth, to looking again at the story breathed out by God and letting it write me. Do read the relevant passage and join in with your responses to (and questions of) the passage in the comments. Firstly, thank you for your wonderful prayer for all of us Tanya. During my prodigal years, I am sure that my adopted mum prayed for me. I was behaving in a way that could have ended up ruining my life; but this never happened. I was being protected from myself. Before I returned to Christ, a Christian lady in work, who wore her faith on her sleeve, asked me if I was O.K. For some reason, I opened up to her and told her of my desperate struggle with depression. This was probably the first time that I had ever done this. I knew somehow that she would not judge me. She listened and then showed me GENUINE concern, and I had a strong feeling of her unconditional love for me. I would be very surprised if she had not prayed for me. She would mention Jesus in almost everything she said, and was not afraid of ridicule for doing so. The reality is that after this encounter, I started to become aware of God. I had listened to American Gospel Music in pretty much the same way that I listened to Soul and Jazz. Shortly after the encounter, the message of the music hit me like an express train when I was listening one day. Then there were the fragments of conversation that stayed with me. It was like tuning a radio. You hear a conversation masked with static, and then it suddenly becomes crystal clear, becoming indistinct again as you move the dial. In random conversations or listening, the significant parts were loud, crystal clear, and stayed in my memory. Then things Christians had said to me years before rose to the surface of my memory, like oxygen bubbles from an aqualung, rising to the surface of a body of water. More recently, Christians in a home group I attended, gathered around me, laid hands on my head, and prayed for my deliverance from depression and chronic fatigue. This took place shortly before a consultation with a psychiatrist that I was due to have. The psychiatrist prescribed a combination of anti depressants that have transformed my life. As I have mentioned to you before, this is miraculous, as I have struggled with the illness for over forty years. I thank God for this generous outpouring of His grace on me. I could bang on all day of how the double stitching of prayer has held me together, but I realise that I have to keep this brief. Like your other readers, I have enjoyed, and been enlightened by your series on Ruth. You have illuminated the story of Naomi, Boaz and Ruth wonderfully. John, This is one of the most beautiful stories of redemption I have ever read in my life. Thank you so much for sharing it in this space. I am reading it on a cold and foggy Holy Saturday morning in Santa Barbara CA – a more perfect time for such a story, I cannot imagine. I praise God with you for the gift of anti-depressants and for the even greater gift of God’s redeeming love. Blessed Easter to you. A blessed Easter to you Diana. Thank you for your encouraging observations. I am pleased that this fragment of my testimony spoke to you. I have arrived home from The Easter Day service at Church. I am a regular singer with the Church Band. Even when profoundly depressed, I disciplined myself to attend rehearsals, and help to lead the worship through music. This proved to be a temporary antidote to the depression. singing worship songs made me feel like a bird released from a cage. Today is the first Easter Sunday that I have been free of depression and the band was enlarged with a fine keyboard player and some great young female singers. These ladies sang with such infectious passion, and I felt the Easter message more tangibly than I ever have in the past. I felt that I wanted to just keep on singing His praises. My transformation has been nothing short of miraculous. Oh John, Diana is right – this is such an AMAZING testimony of redemption and those ways in which God puts his fingerprints all over our lives! It has been such a long, long road for you to walk down – I am hoping your journey can be like Naomi’s. I am sure that it will be Tanya. God never changes, and I have no reason to doubt that He hears our prayers as he heard the prayers of Naomi, Ruth and Boaz. I have to remain faithful and trust in god, and make every effort to take up my cross and follow Jesus. I know that I will stumble and fall because I am a sinner. but as St. Paul tells us, ” Therefore, there is now no condemnation for those who are in Christ Jesus. Romans 8 v.1 (N.I.V. (I have just Googled that verse, and the King James version is a fuller translation of this single verse. “There is therefore now no condemnation to them which are in Christ Jesus, who walk not after the flesh, but after the Spirit). I am mindful of the many instances in the Bible where God uses adversity to His purposes, and have no reason to doubt that He may have plans for me to use my experiences to His purpose. I say, may, because He may have different plans for me. Whatever, I wait on Him. Beautiful, Tanya. Stunning, actually and so well-woven together . . . yesterday and today and forever. Amen. Thank you SO much for these precious words of encouragement, Diana! A beautiful prayer by you Tanya. Thank you – it felt like a holy thing, writing those words at the end. I have really loved your series on Ruth and this last post is probably my favourite one. In reading through Ruth in the past, I assumed these were words of blessing and failed to notice them as prayer. How powerfully God works through such utterances. It gives us hope for our own seemingly insignificant offerings. Keep on pouring those words of affirmation and grace into your young son’s ears and heart. His soul will be watered by them and his spirit enlivened. You are leaving a legacy of faith to bear fruit in the future. Thanks so much, Joy – I’m so glad it connected so powerfully with you! Seeing the women invoke the names of the past heroines made me realise we could do that in prayer too; pray through those qualities we’ve seen in godly people and ask for them in our life. And yes – it also gives me hope for my futile offerings of prayer – it has been a real revelation. I have so enjoyed your series on Ruth, Tanya. I’m ashamed to say that I’ve never taken notice of all the prayer woven throughout this story. But yes, prayer is threaded into our lives in the day-to-day. Usually for the seemingly ‘small’ stuff of life. Yet He hears. Oftentimes we forget those little prayers, but Thank God, He doesn’t. I don’t know about generations of family praying for the same thing. There aren’t too many Christians in my family line, but I DO know I had a Gramma who prayed for me. And I’m sure that one of the main reasons I’m a believer today, is because of her prayers for me so long ago. She was faithful to pray–He was faithful to answer. Thank you, Jillie – and so encouraging abut your Gramma too! May I be a prayerful granny, if I ever get to be a granny! Like Alice I had tea & a happy weep (in spite of having the heads up – I often don’t cry if there’s a weep warning)! Conscious there are so many loose threads in my prayer life & knots too but in spite of that God still does his work by grace in the -‘May you know the whisper of the Spirit as He directs your life in ways that you are barely aware of’- way. Thanks for the tears and the amen – it means a lot! oh and my computer amended my AMEN-ING!!! I made a cup of tea especially for sitting down to read this. I have never noticed those prayers and I guess I would have thought of them as words of blessing – but God hears and acts. I am amazed by them. Yesterday I was so frustrated by my struggle to pray. This has really encouraged me. And your prayer of blessing at the end had me weeping and amending. Thank you. Leave a Reply to Alice Click here to cancel reply.